Eagle Scout Ian Estrada, Troop 69, completed his Eagle Scout project by placing flag holders at the gravesites of Veterans. This very ambitious project covered all five of the historic pioneer cemeteries Palatine Township owns. Through his research and diligence, Eagle Scout Estrada was able to secure sturdy metal flag holders. These metal flag holders will be able to stand the test of time. Also, each Memorial Day, the American Legion Post 690 places small American flags at the graves of those who have served in the military. Depending on the weather, and how hard the ground is from winter, Ian Estrada’s Eagle Scout project will help facilitate this honor. Dozens of flags prominently displayed in Eagle Scout Estrada’s flag holders will indeed be a stirring tribute to those who have served our country. Eagle Scout Estrada has also mapped out the grave locations of all who are buried at the Township’s pioneer cemeteries. Please click on the name of the cemetery Cady, Salem, Sutherland, Wolfrum to view the mapping. Roll your mouse over each cell to see the details available for that gravesite. Due to the age of several stones, and lack of record, some information is missing. Eagle Scout Estrada’s gravesite mapping is a much needed addition to the Township’s Cemetery Committee official records. 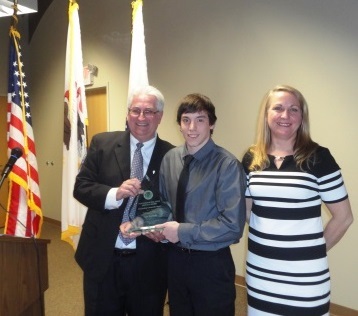 Eagle Scout Estrada was presented with a TOPS (Township of Palatine Service) award at the 165th Annual Town Meeting.